Ok to start of with I do have an excuse that I can use due to the lack of fishy reports but I have been out every day since my last post so we do have some exciting pics and info to report today. 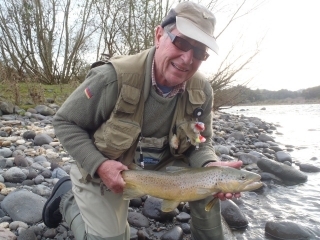 Anglers will no longer be able to use the excuse that thereÂ is no fish in the river or fishing is hard as the rivers are full of great looking fish. If you are not getting onto fish at the moment you need to practice some more or move about more. We have had some perfect conditions for fish to be running the rivers with some quite overcast days, high river levels and dark nights which all play vital parts in making our trout active. Currently it is snowing outside my house in Taupo and the hills at Acacia Bay are covered in snow on the ground which is the lowest I have ever seen it. Fish will be loving the drop in temperature and dull conditions and will be in all our rivers for the next few days. This week as you can see from the pictures I have moved around the countryside fishing the rivers which conditions best suited and done very well in most. 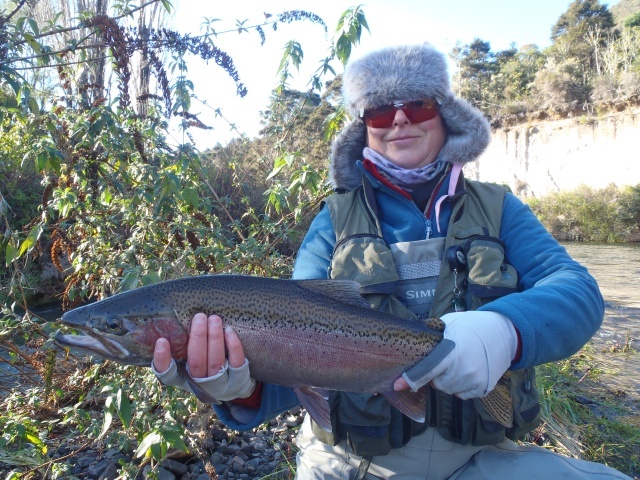 I think it is very important that guides are confident on more than just one river as a hard day can be turned into a great day with just one pool or one decision to move on. I have fished the Waimarino, Hine, Whanganui and the most productive on most days the mighty Tongariro. 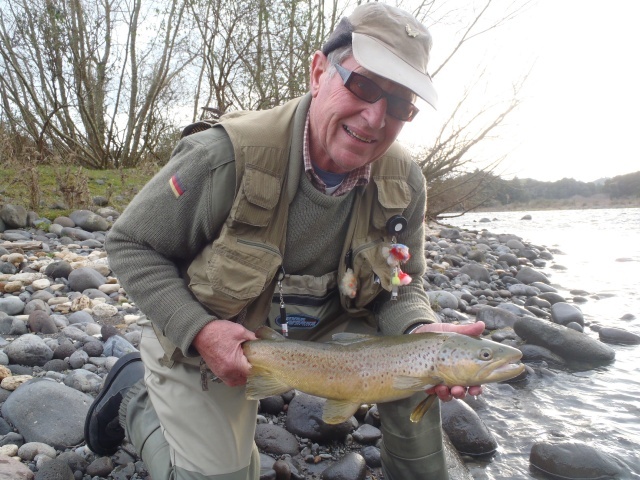 All rivers have been high but in some cases very clear and still fishable. I have had a real mixed bag of anglers this week with Mark and Helen from down south, Blair and Ken from Auckland, Sue fromÂ Rotoroua, Ainsley from AucklandÂ and Mark from Cambridge all which were just a great laugh to spend time with. All these anglers had varying skill levels but with that in mind the water we fished produced fish and some great days with personal bests were achieved. Helen easily out fished Mark on the Hine which I think he might hear about for some months yet withÂ her best rainbow coming in at about 5lb. We actually hit it pretty lucky when we fished here and I actually had flashbacks to last year when they pulled 15 fish out of one pool in about 2 hours. This river has fished fairly well over the past week especially if you are first lines through in nay given pool. The main rule to fishing here is to get the weight of your flies right as if you are too light they simply wont be in the fish zone. 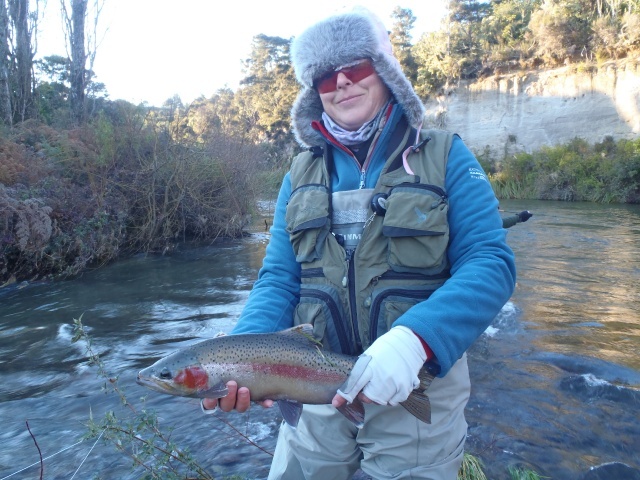 The Tongariro also has plenty of trout in it at the moment and getting up early to hit your favourite hole will be worth braving the morning chill.Fish are scattered throughout the entire river and skilled fisherman will have no problems pulling the odd fish out all day long. Mark from Cambridge was my mostÂ skilled angler this week and he managed to land fish in the braids, never fails, and Stag pool finishing up with ten fish in a half day outing which is great fishing. I will start most of my guiding fairly early at the moment and concentrate down river before moving through town pools or the upper section . This method simply allows me to see what fish have moved in the river and gives the client a good chance of hitting a bigger group of fish before they disperse throughout the larger pools. The fishery really has had a positive turn around and anglers all seem to be very happy with the fish they are hooking into. 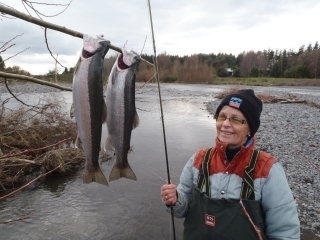 The clients I took this week are usually Rotorua fishermanÂ Â and rate our fish as being in much better conditionÂ here this year which is interesting? All fish we landed especially in the lower reaches have been quite fresh and in good condition which means they must be finding food somewhere! The hens are to be looked after guys some are extremely fat with eggs and might look good to take but when you open them they soon turn into skinny envelopes and will be disappointing. 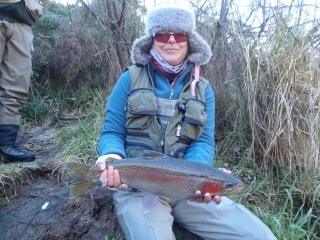 I fished the Whanganui mid week with Blair and Ken which was a nice change of scenery. We had the river to ourselfes and did not see another foot print which is typical of this time of year for here-summer is another story. The river has recentlyÂ suffered a flood of 500cumecs which is huge for hereÂ andÂ I am a little worried for some of the fish stocks as this would have washed away spawned trout and indeed their eggs. We didn’t haveÂ a huge fish day but caughtÂ a few good browns and some smaller rainbows which have held their condition well. The browns looked like they had been working hard in the high water and were quite tired this could have been a result of the flood or just winter spawning , time will tell. The river out here is still a bit high and I would give it a few weeksÂ to settle down before making the trip over the hill. 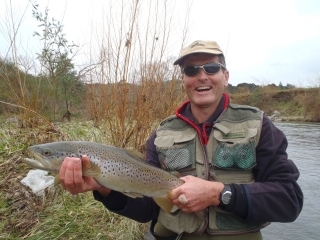 The Taupo fishery really is in full swing guys and there will be a few anglers on the river for the next few weeks. Try and make it up mid week toÂ avoid having to be on the river in the dark to get to your best runÂ or pool. Fish will be moving through all week and even more so with the local snow melting as the fish will smell this and the trigger will be pulled. Stock your box with glo bugs,Â weighted nymphs and small naturalsÂ and always make sure you have split shot depending on where you might be fishing. Glo bugs in the morning or on dull days switching to naturals such as Caddis when the sun gets up and on the water.